Home » LinkedIn News » Does LinkedIn really need Kudos? 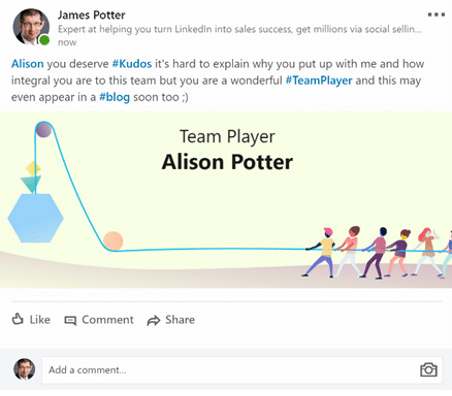 During June last year LinkedIn quietly introduced Kudos as a mechanism for you to publicly say ‘thank you’ and more to someone for some input into your world or business, but has it been widely adopted? No, well … not yet. 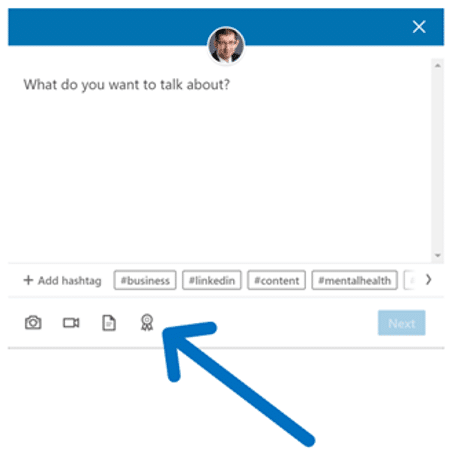 I suspect that is mostly because (as always) LinkedIn didn’t tell people it was there, how to do it or why it might help them so I thought I’d explain it here. The driving force behind Kudos (according to LinkedIn) comes back to the people centric and staff management roots of LinkedIn. An employee recognised for their efforts is significantly happier and hence more likely to stay in their role and the business – I must confess my first thought was that they had copied Strava (the Cycling tracking app). 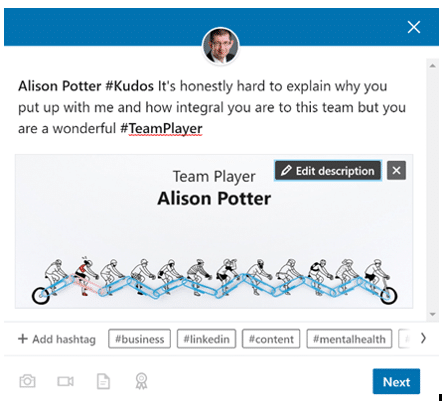 Not enough people say thank you in life let alone on LinkedIn, so they wanted to give you a simpler way to say thank you to someone above and beyond a posted status message hence Kudos was born. But the giving of Kudos is not without limits – you can only give three per day at present. 1. Select the Small rosette (which LinkedIn uses to indicate Kudos) on the post page. 2. It will then ask you who you want to give Kudos to or the group of people. It is worth highlighting that you can only give kudos to someone who you are already connected to at level one. Simply type the name or names of the people you want to include. 3. Then select the type of award from the predetermined list of: Thank You, Going Above and Beyond, Inspirational Leader, Team Player, Great Job, Making Work Fun, Amazing Mentor, Outside the Box Thinker, Great Presentation or Making an Impact. There are several designs here and it will offer you a random one, you don’t get to choose (sadly). 4. The design pops up with a pre-populated template that you can then personalise, making the recipient feeling even more special and select next. 5. You can also give Kudos directly from someones profile. Simply select the ‘More …’ option next to message and then follow the procedure above. 6. Once you hit next you are then given the options on who to share it with as per any posted status update. The Kudos appears as a notification to the recipient and is also shared with all your connections as part of your normal feed and appears as per the example below. 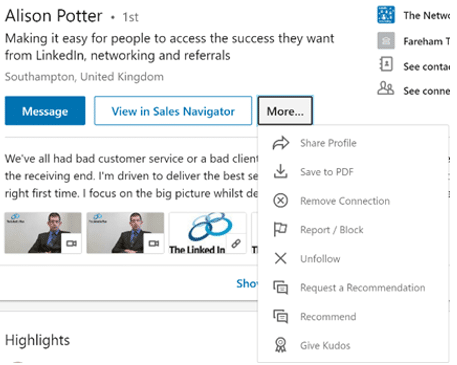 I can certainly see why people get confused with the other options on LinkedIn like status posts, endorsements and recommendations so I thought I would elaborate a little on each ones purpose and value. Endorsements are just an indicator that an individual knows that you have that skill in real life and is happy to show that on your profile with their own face. It is very skill specific whereas Kudos is more all-encompassing across skills, outlook, behaviours and more. However, Endorsements remain on your profile for as long as you are connected, whereas Kudos is a one-off event and hence appears in the feed of activity timeline and hence equally disappears. There is no real comparison between Kudos and recommendations as they are so different! A recommendation has huge trust with the audience on LinkedIn, conveys emotion, value and is to be prized. They are permanent in your profile, permanent in the profile of the person that wrote it for you and not at all transient like Kudos. My view on Kudos? 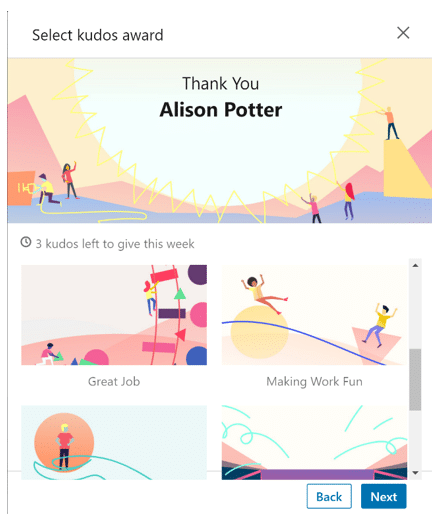 Interesting that they haven’t been widely adopted, we rarely see them used, but part of that is human nature where we rarely say thank you in public – I’m carefully not saying that’s wrong as I personally think we should do it more – but with choices such as posts, endorsements and recommendations in place do we need another option in Kudos? I am not sure we do but why don’t you give it a try and see how you get along. « What’s more important – a LinkedIn personal profile or a company profile?